The Global Game Jam 2010 concluded over 30 days ago, but the treasure trove of indy creations it left behind remains largely unexplored. Then again, how is anyone supposed to review some 1000 games created specifically for an event that shuns any global judging? Who has that kind of time anyway? Certainly not overworked grad students! But I'm here to tell you, you should try! Among these games you can find some of the most innovative zero-budget designs ever devised in the span of 48 hours and you can see the source code that produced them. I'm writing this review partly in hope of inspiring similar reflections from GGJ enthusiasts and partly in anticipation of our upcoming talk at the GDC Education Summit on this year's Global Game Jam. We kicked off the inaugural GGJ back in 2009 with 53 sites in 23 countries. At the end, we had about 370 games produced. At this year's event we had 138 jam sites in 39 countries and nearly tripled the number of project submissions. In addition to the expected jam powerhouses, Nordic Game Jam (Denmark) and Dutch Game Garden we had big participation from Israeli Game Developers, METUTECH-ATOM (Turkey), NYU Game Center, Tumbleweed Game Jam (Norway), and Game Jam Sydney. In the US we had 55 jam sites in 30 states which accounted for 40% of total sites. There was great representation from Canada (10 sites), UK (8 sites), Germany (5 sites), Brazil (5 sites) and Finland (4 sites). Participation in Japan was not as high as it could have been due to bad timing with Japanese University schedules. We also approved first-timer sites in Colombia, Russia, Poland, India, Pakistan and Philippines and Malaysia. See the whole list. There were many incredible stories from the jam sites. Only one actual jammer showed up to the site at the Johnson County Community College in Overland Park, Kansas. But he and the organizer worked all weekend and together submitted Bacterial Invasion. It's actually a decent, polished game with at least 3 levels (that's as far as I got). I personally spent the weekend with the jammers at Santa Cruz who contributed 9 games. An audience choice vote was held with the "2D bullet hell shmup" RoboPunk narrowly beating the online virtual boardgame Sinistrum. Big disclaimer. I have probably played only about 50 games which is barely 5% of the total! I'm certain I left out great gems that I will have to get to later, but I'm sure great games will emerge on their own. So don't take this as anything other than a personal favorites list in progress. As a reminder, the 2010 global constraint was "deception." This actually make it harder to review these games because quite a few of them implement the constraint as a surprise which you don't want to spoil. 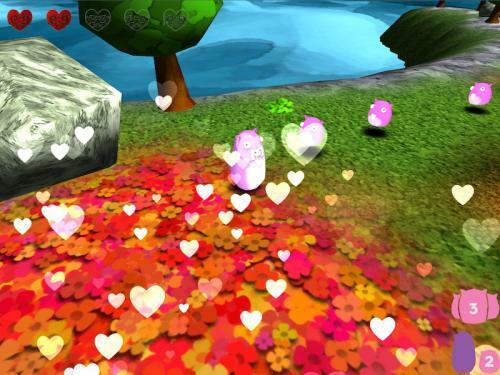 K.M.O.If you're looking for cute, fuzzy, Mac friendly game of "love leading to death", look no further than Kawaii Maximum Overkill from the Paris Game Jam. It's a full 3D rendered game with beautiful art work. You play some kind of a limbless pig-like devil incarnate. Smaller creatures follow you around, express affection and try to touch you (which actually kills you). Your job is to lure them to a designated area so they can eaten! Yea, it's a little dark, but brilliantly executed with just the right degree of difficulty, 3 nice levels and great music/sound. One of the games making the biggest buzz, (if web hit rates are any indication) is Gnilley, from Game Jam Sydney. Advertised as "a thing with a microphone", the game makes use of the mic as a controller in an otherwise routine 2D dungeon explorer game. The instructions are simple: "Yell --> Succeed". The team made a great demonstration video on their website. This game is certain to be developed further and be published for real. Great job guys! limonusLet me now ask you a question. What was the last game you played that featured suicide-bombing citrus fruit? That's right, somebody went there! A team from IGDA Recife (Brazil), to be exact. 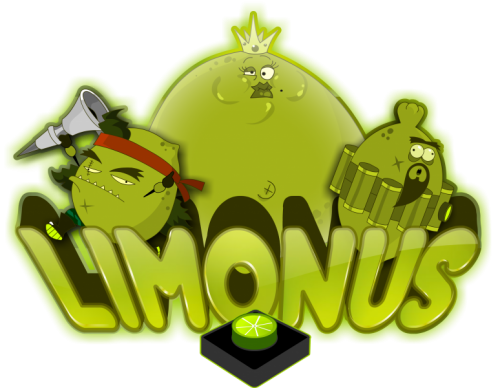 In Limonus you deploy self-sacrificial lime-soldiers against insects who want to kill your lime-king. Your soldiers either blow themselves up taking an ant hill with them, or perform a harakiri and spread their acidic juices on to oncoming wasps. As you might have guessed, it's not serious and it would be a real stretch to find any social commentary in this game. So, September 12th, it's not, but it does have great animation, engaging game-play and its own level designer. The latter is especially useful because the first level is rather difficult. It's also web based. Always a plus in my book. Play it online. In contrast to Limonus, The Mirror is designed to evoke some kind of social commentary, even if it is the "do it yourself" kind of commentary. The game is the latest work of Swedish experimental game developer Cactus (Jonothan Soderstrom) and his teammates at the Nordic Game Jam. Cactus is known for disturbing imagery and this game is no exception. You are interacting with what look like facial features on a vaguely phallic surface. There are things that look like pimples with well known religious symbols on them and can pop them and move them around. From Retro Affect Studio in Gilbert, Arizona come the game Depict1. The graphics and text instructions definitely pay homage to many things "retro". The game play starts out like a familiar platformer but takes a deceptive turn. I can't say much more, except it would be worth your time to check it out. Author / Professor Jasper Juul of Ludologist fame, currently at NYU Game center, submitted what has to be considered the first "response" game in Global Game Jam's short history. This "conceptual game" is called 4:32 and it is a response to Petri Purho's 2009 GGJ submission 4 Minutes and 33 Seconds of Uniqueness. That game itself was a reference to John Cage's postmodern "musical" composition, 4'33". In the spirit of the original Cage piece which pushed the boundaries of "music", Purho's 2009 submission pushed the boundaries of "game." His submission lacked any interaction whatsoever beyond just starting the program. Now Juul's response promises a boundary push of its own. Again, I won't spoil it for you but a spirited discussion has started already. Try playing it first, though. Start here. RunRunRunJumpAnother game that gets downright philosophical is RunRunRunJump by Singapore-MIT Gambit Game Lab. You play a giant capital letter "I" traveling along a (mostly) 1D line made up of what looks like "Magnetic Poetry" tiles, each with a word written on it. The word is the thing you have to do like "run" or "jump." 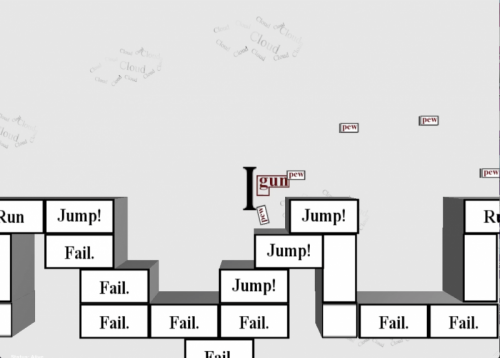 If you land on "fail", you promptly lose. I don't know if the designers intended for this but playing this game immediately reminded me of Kian Bashiri's You have to Burn the Rope. If the comparison is valid, then RRRJ is like YHBR on steroids. This work takes performative deconstruction in games to a whole new level. Whereas YHBR gives you explicit instructions in the title and the initial screens, RRRJ gives them to you on every single step of the game! Whereas Henrik Nåmark's "Now You're A hero" is music that makes meta-references to the player in the game, Daniel Perry's music in RRRJ makes meta-references to the music itself by literally singing "bass" and "melody" the whole time. More could be said of this, I'm sure. Just play it. You won't be sorry. Well, that's all I have for now. I might follow up with more reviews later. I hope it was wroth your time. I had a great time making an RTS during a single weekend with almost a dozen fellow global game jammers whom I never meet before! I haven't slept much... but it was definitely worth it. The team was absolutely fantastic, everyone were dedicated and resourceful. I feel very proud of what we have achieved in such a small time frame. The organizers at FullSail did a great job, except choosing a name for the location on the web site - haha what's with "City Wide GGJ"? Be sure to check out the other games at "City Wide GGJ"! Oh, these pictures don't do proper justice to the actual game. It's also quite hard to get a screenshot while playing (using a Mac, so it requires me to use like six fingers to get the damn screenshot). Oh, and wait til you hear the sounds. We're goiung to record a gameplay video later on, and til then we'll be working like mad to polish this thing.